Okay, “miracle” is over the top(per). But if you’ve been waking up feeling achy, have certain kinds of pain, or just need to renew the comfort of a hard but still-sound mattress...the right topper can feel pretty miraculous. Here’s a handy primer on how to choose the best mattress topper for your situation. If you wake up with stiff, sore hips—your mattress is most likely too firm. You might also be a side sleeper or tend to stay in one position for most of the night. When your body is under constant pressure from a too-hard surface, circulation is compromised as the tiny veins called capillaries collapse. That often creates hip soreness and aches, with discomfort at its worst in the mornings. Underlying problems such as arthritis of the hip, of course, may compound the misery. A soft, natural latex mattress topper can make your bed feel new and your hips much more comfortable. Customizable toppers allow you to choose the type of latex or even the degree of softness you’d like; others add casings made of stretchy, knitted fabric for a luxurious, embracing feel. When you’re on your side, the greatest amount of torso weight is borne by your shoulders. When a mattress has a shallow memory foam or cold gel surface, or features “perimeter support” (extra-stiff foam around the edges)—side sleeping can become very uncomfortable. Broad-shouldered people often experience soreness, stiffness and tingling. And they miss out on how comfortable a sleep surface can be when it accommodates the widest parts of the body. A mattress topper in soft natural latex allows shoulders (and hips) to sink in just enough to relieve the pressure while still keeping the spine aligned. If a topper is too thick, however, back support may be compromised. A 3" to 4" natural latex topper provides enough cushioning to make side sleeping comfortable again without destabilizing the spine. If you prefer moderate softness, a duvet-style topper can add deluxe cushioning without the uber-pillowy feel. Wool-filled toppers offer dense but breathable comfort that feels quite different from foams. The Harmony is one 3" layer of your choice of natural latex in the Savvy Rest organic casing. Add pillowy softness to your mattress with three inches of domestically-sourced, natural wool. Many people who have had “slipped” (herniated) disks or other nerve injuries to the back will endure very hard mattresses in order to keep their spines stable during the night. It makes sense, as the electric pain of sciatica can be acute. But there are better solutions. Generally, a very deep or ultra-soft mattress topper, while it may feel wonderful for a few minutes in a showroom, is a risky choice for people with severe back pain. After a few nights or weeks, the pain may flare up again. Pain that results from injury or disk problems can be re-triggered by toppers that allow a back sleeper to “sink in” too far. But even people with these back issues can enjoy a more comfortable mattress, with a fiber-filled topper that’s not too thick. 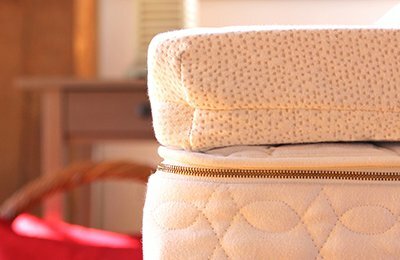 A 3" wool-filled topper will gently cushion the mattress, improve air circulation and reduce heat build-up beneath the sleeper. These toppers won’t compromise spinal support. Simple pressure point areas in the back, such as over the tailbone, can be relieved by almost any topper. You can choose whichever style appeals, and any depth that feels comfortable. The contouring reaction of this synthetic foam occurs when your body heat sets off a chemical reaction within the foam. It’s a molding, almost clasping feel that some users compare to sleeping in damp sand. If you’ve never encountered memory foam before, the novelty of the sensation can feel exhilarating—at first. Apart from the toxic chemicals, another downside of memory foam toppers is that the foam not only requires trapped body heat to create its close-fitting feel—but also to maintain it. This means that every time you shift or adjust position during the night, your body has to re-heat the foam to make it feel good again. The full response can take up to 15 minutes, so many people find that despite its gadget-y appeal, memory foam makes sleep more restless. 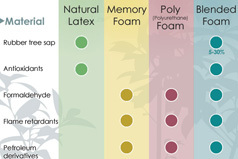 Natural latex is more supple, more breathable, and safer for your health than memory foam, hybrid foams or gels. One of the questions we always make sure to ask our customers is whether they sleep on their back, stomach or side. This is one of the most important factors when trying to determine the right mattress feel for you. There is nothing more uncomfortable than sinking into a mattress when you want a firmer feel or feeling like you’re sleeping on a rock when you want a mattress that will gently hug you. Here's what you can do. Do you suffer from back pain? 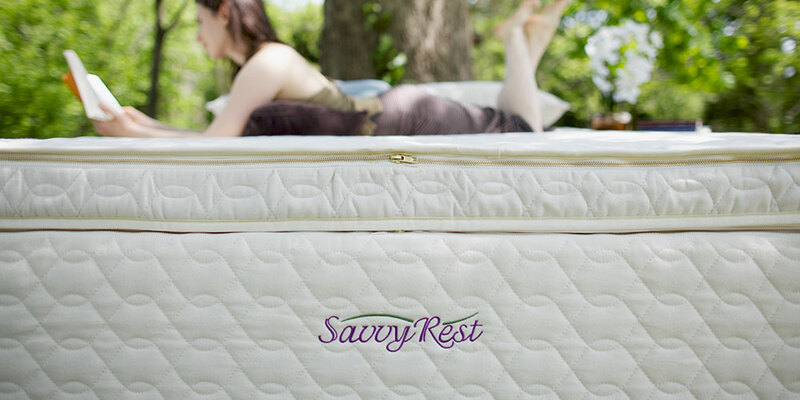 Find out how an organic Savvy Rest mattress can help. We offer several natural latex and organic mattresses, both customizable and non-customizable. 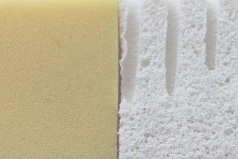 Compare and contrast the difference between these two popular foams. A comparison of the types of foams found in mattresses.